Show them what you love: Seven. French Toast with Cheese and Strawberry finish! Seven. 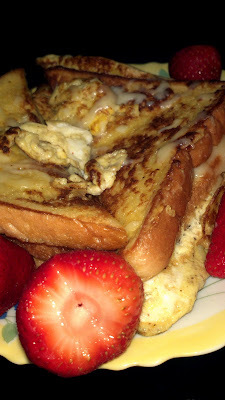 French Toast with Cheese and Strawberry finish! Whisk the 2 eggs in a small bowl. Put in some pepper and salt for taste. Heat frying pan and put in butter. Dip the slices of bread in the egg and fry it until golden brown. Once all bread are done, sprinkle the cheeses on top and put it in the microwave for 25 secs! As for the strawberries, arrange it at the side for a nice finish! Wonderful breakfast, I must say! Life is amazing. To forget the pain and remember the sweet moments, Is when you paint. To satisfy that craving and to show your love for food, Is when you bake or cook. NINE. 5 awesome minute of baking! TWO. Here comes the painting day!